Governor Paul LePage delivers his final State of the State address before a joint session of the Maine Legislature in Augusta in February 2018. AUGUSTA, Maine — Before leaving office in January, Gov. Paul LePage will take the unusual step of releasing a two-year budget proposal looking to cement his legacy by cutting income taxes and providing funding for — or just eliminating — voter-approved Medicaid expansion. That document’s effect will largely rely on the outcome of the 2018 election to succeed the term-limited Republican governor. His party’s nominee, businessman Shawn Moody, could use it as a valuable starting point. Attorney General Janet Mills, a Democrat, could trash much of it if she wins the four-person Blaine House race. While the two-year budget will recommend continuing some of the governor’s more controversial initiatives, it will also include the normal and less hotly contested nuts and bolts of a two-year budget, which could hover around the $7 billion mark over the next two fiscal years. However, the proposed spending blueprint will be released in mid-November just after the election and it could loom over the transition of power. A 23-page outline of the budget released Wednesday shows it to be a political statement from LePage. His budget chief said the governor has “very strong feelings” about where the state should go and is “proud of a number of things that his administration has accomplished,” though it contains “good governance” principles that he said any candidate could accept. “What this document does is give us an opportunity to frame up those accomplishments and then offer some steps where we should go moving forward,” said Alec Porteous, the commissioner of the Maine Department of Financial and Administrative Services. The plan isn’t fleshed out. Porteous declined comment on how the state would meet some of the goals in the document, including a LePage initiative aimed at directing K-12 school funding away from administration to get “more resources into the classroom” — a drum he has often beaten during nearly eight years in office. However, LePage will continue a long crusade to eliminate income taxes in Maine. He won the largest income tax cut in Maine history in the first budget he signed in 2011. His budget would collapse Maine’s three income tax brackets of 5.8 percent, 6.5 percent and 7.15 percent to two at 4.5 percent and 6 percent. He also will reiterate past demands on Medicaid expansion funding, asking lawmakers either to enshrine a hospital tax that was quickly nixed by the Legislature earlier this year to fund the voter-approved law or repeal it — which effectively won’t happen if Democrats at least remain in charge of one legislative chamber. There are a number of other items in the budget proposal as well, including an open-ended goal of boosting expansion of rural broadband access. Porteous said the state is still exploring a vehicle to best do that. The LePage administration also wants to hire 15 new state troopers and make day visits at state parks free for all Mainers, though camping fees would remain. 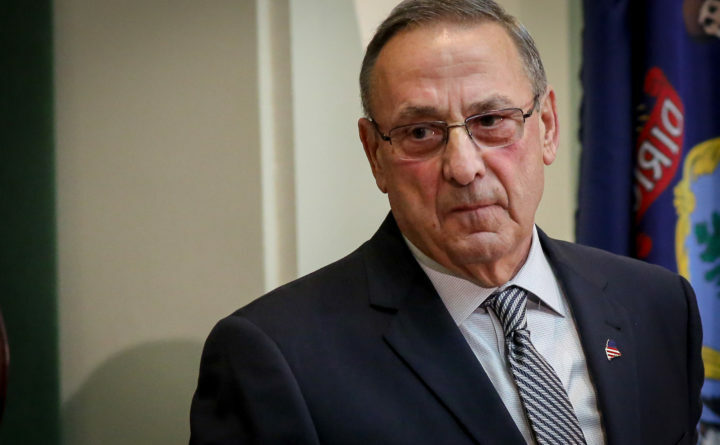 In a statement attached to the budget framework, LePage said having a “fully baked plan to hand off is a matter of good governance,” adding that the typical two months isn’t enough time for new governors to fully form their first two-year budget. How much it affects the next budget will be up to Mills, Moody or one of the two independent candidates — State Treasurer Terry Hayes and consultant Alan Caron. Three of them were largely circumspect about the details of the plan in statements on Thursday. Caron said LePage’s attempts to shape future conversations “are not welcome or helpful,” though he agreed with the governor that “we should pay our bills on time and not use our payables as a credit card for spending.” Hayes said she looked forward to reviewing the budget. Waterford resident Sawin Millett, a veteran of four Maine administrations who served as LePage’s first budget commissioner until 2014 and a Republican candidate for the House of Representatives this year, said it’s typical for the governor-elect to take the lead on formulating a new budget effectively after a December revenue forecast that illuminates any budget gaps. During LePage’s transition in late 2010, Millett said LePage only used the outgoing Democratic Gov. John Baldacci’s summary of the state’s budget challenges as a starting point. “Depending on which of the four become the governor-elect, then that document may not have much relevance to the governor-elect or it ay be a good and valid starting point,” Millett said.